We are on the beach - at the far end of the main street ! Come exploring with us or let us supply the bits and pieces to make your day on the beach - or in the water that much more enjoyable. We provide the latest in design, sit on Kayaks, built for stability and comfort. 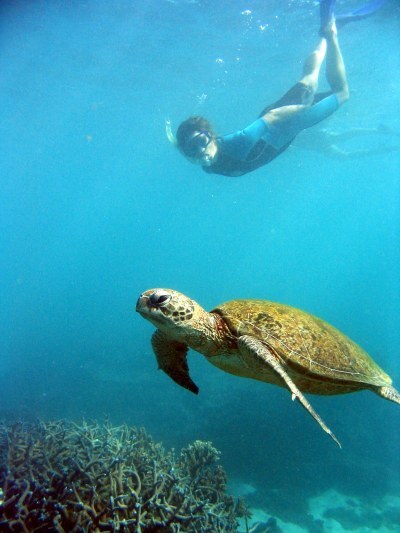 Explore the pristine waters of Ningaloo Reef with our experienced, local guides. No kayaking experience is necessary, just a sense for adventure. Join us for an ecological view of the Ningaloo Marine Park. Get a taste for kayaking. Snorkel the world famous Ningaloo Reef [outer reef], swim amongst thousands of tropical fish, spot wildlife - turtles, rays etc. Join us for an action packed 2 or 3 hour guided tour. We visit awesome snorkel sites. Try a drift snorkel at the outer reef over the amazing coral formations. Every Kayak tour will be digitally photographed by your guide, print your own photographs or email them to your friends. Fully edited photos on CD from your tour will be for sale for $25 ( approx 40 photos ) - including photos taken underwater. Tours are weather dependant. Minimum numbers apply.